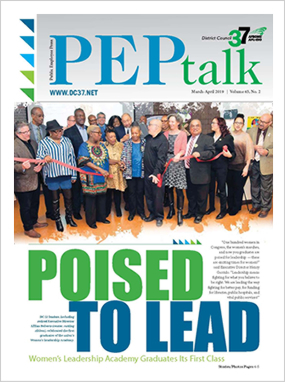 DC 37 is your union, PEP is your newspaper, and members' letters to the editor on any subject are always welcome. Please be brief and be sure to include your name, job title, local and daytime phone. Letters may be edited for style and length. PEP is the official newspaper of District Council 37, AFSCME, AFL-CIO. Listen to NYCHA residents and workers! PEP photos by Clarence Elie-Rivera, unless otherwise indicated.